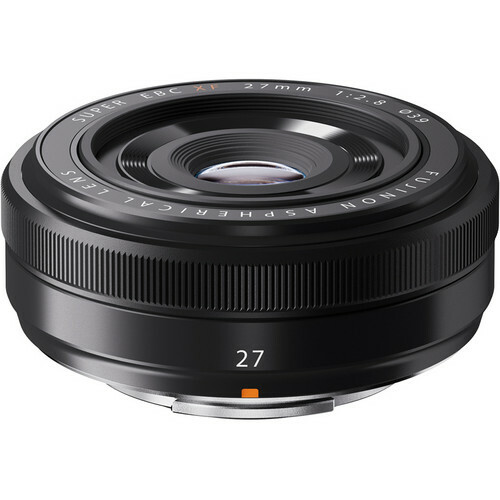 Featuring an especially slim, pancake design, the black XF 27mm f/2.8 from FUJIFILM is a versatile 41mm-equivalent prime that is ideal for travel and everyday shooting. Its f/2.8 maximum aperture helps to realize its slim stature, and also suits working in difficult lighting conditions and offers control over depth of field for working with selective focus techniques. One aspherical element has been incorporated in the optical design, and helps to reduce distortion and spherical aberrations, and a Super EBC coating has also been applied to control flare and ghosting. Additionally, benefitting both photo and video applications, a high-torque DC coreless motor is used to realize quick, accurate, and near-silent autofocus performance. Short normal-length prime is designed for APS-C-format FUJIFILM X-mount mirrorless cameras and provides a 41mm equivalent focal length. High-torque DC coreless motor provides especially quick, precise, and responsive autofocus performance. Box Dimensions (LxWxH) 5.7 x 4.2 x 3.6"
XF 27mm f/2.8 Lens (Black) is rated 4.5 out of 5 by 153. Rated 4 out of 5 by Maksim from On of the best walk-around lenses This lens is so light and so tiny - and this is the main characteristic of xf 27mm. It is pretty much feels like a lens cap. Because of that, this lens almost never leaves my camera, unless I need shallow depth of field or longer/wider field of view. Other than that, it is always with me - whenever I am travelling, hiking or walking. This lens captures more pictures than some of my better lenses. Optically it is great - sharp, with fast auto-focus in a good light. It does not have an aperture ring, but I am used to changing the aperture on a camera body. Rated 5 out of 5 by N. Wiley from Completely changes the X-e2 I was borderline ready to sell my Fuji X-e2 until I saw this lens on sale and purchased it. Swapping out the kit 18-55mm for this has me back on board. The bokeh is pleasing, the speed is great for the money, I even love the focal length. I tend to shoot at 35mm or 50mm this gives me a perfect medium between the two. I was worried it would be a little too tight, I really love my wide angle lenses but it still gets me just what a I want. It seriously transforms this camera it the fun kick around street camera I'd been looking for. My only complaint is the lack of aperture ring, but that's easily made up for in ease of use with the dial on the back. Rated 3 out of 5 by Martin from Optics are great, ergonomics so-so I love how small this lens is, and how good the results turn out. However, the absence of an aperture ring was not a satisfactory compromise. In its absence, you control the aperture -- and significantly, the exposure mode -- using the dial on the back of the camera. Too many times I inadvertently nudged the dial, which popped the camera from Programmed Mode to Aperture Mode, and resulted in a wasted shot at too low a shutter speed. If I had my druthers, the focus ring on the lens would be an aperture ring. I have never, ever focused my X-Pro1 manually. I now use a 35 mm f/2 as my normal lens, since it has an aperture ring, and my 27 mm is gathering dust. Rated 5 out of 5 by Hanbit Kwon from The Best Pancake Lens Currentely Available This simply is the best pancake lens available. I'm a working photographer and I've used many lenses, mostly Nikons, from old non AI, Ai-s, and the latest VR lenses. I did enjoy using old Nikon series E 50mm pancake lenses. I didn't think or expected that I would find any better pancake lens but this Fuji lens was extraordinary. Yes I admit I'm a pixel peeper. I have a huge graphic display and I have a habit of looking at sharpness. This lens is indeed sharp with vivid color rendition and contrast. This is the lens I carry and use most of the time with my X-E1(this camera is epic when paired with this lens). I'm tempted to buy another one in black for my brand new X-Pro1. It will just be great on X-Pro1 too. Rated 5 out of 5 by RichieP from Great value, get the filter protector, Heliopan lens hood A prime lens makes a difference and this one is perfect for everyday use on my X-T10 and very affordable. It requires the Fujifilm UV protector filter because it is exposed and I use the cute but useful Heliopan lens hood. It is very solid. OIS is not needed with today's fast cameras with f 2.8 more than adequate. 27 mm is a very pleasing perspective especially for people shots as well as landscapes with excellent color saturation and clarity. My kit lens stays at home. A prime lens also makes one move around more the way classic photography used to be. If you are looking to get your first prime lens this is the one to get. And one more thing: BH is the best company for photog equip, best service, most reliable. Rated 4 out of 5 by LoCo Bob from Sweet Little Lens Atually would give it 4.5 stars. Nice small, unobtrusive footprint. Very sharp and AF on the X-Pro 1 is fast. Focus peaking works well in manual. Like the 40mm equivalent field of view, fitting nicely between 35 and 50mm. Quick, solid feel when focusing manually, even for fly by wire.Best feature is that you dial in the f stop in decimal equivalents (ie, 2.8, 2.9, 3.0) rather than in full stops. Traded in my manual Contax G 28mm with adaptor for this lens. The output quality, autofocus and focus peaking in manual mode made this a very fair exhchange. (OK, my right brain misses the Ziess glass. )Why not 5 stars? Would like to have one more stop and slightly quirkier bokeh. Hmmm.. I guess that would be $1000 more for something Zeiss-like. Rated 5 out of 5 by TriX-46 from Better than expected Sharp! I have an X-T1 with the following lenses: 14, 23, 18-55, 55-200. I wanted to take just one lens on a trip to California for a wedding. After a long time deliberating, I decided to purchase the 27 over the 35 because of size and weight. No regrets. The lens performed exquisitely and for the first time since the days of my Leicas, I was able to dilute myself into the crowd without interrupting anything or being too obvious. The same happened photographing the streets in Palo Alto and Mountain View. Excellent. Great, fast service from B&H, as usual. Rated 4 out of 5 by Kevin from Better than Expected at a Great Price. Didn't have the budget for the 23mm f1.4 so I settled for this lens. I Love it! It shoots photos that are even better than the ones I pixel-peeped on all the various websites. The AF is fast and accurate 9 out of 10 times. It makes my X-E1 ultra-portable. I also own the 35mm f1.4 and the 27mm is just a step behind in sharpness. The lack of Image Stabilization is a non-factor as the Fuji cameras can creep up high into the ISO scales and still produce excellent photos. Overall it is a steal at the $$ price and will simply cause you to carry your camera with you more often.